The Magnolia Fire Company is pleased to announce that Courier -Post has awarded us with the Best of South Jersey for Fire Departments! We would like to thank the Courier Post and all the Voters who took time out of their day to vote! Have free time? We have just the job for you ! The Magnolia Fire Company is looking for dedicated people interested in helping their community. Be a part of the tradition, the excitement, and the community! Do you have what it takes ? Click the button below ! 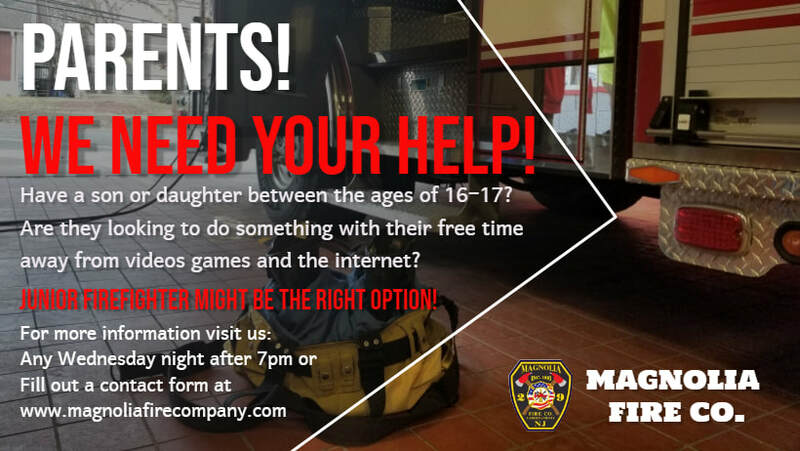 The Magnolia Fire Company is looking for eager individuals that may not want to be a firefighter but still want to help the community and assist us with traffic safety. All training will be provided . If interested please click the button below to fill out the BECOME A MEMBER form! SPECIAL THANKS TO MOOSE SAFETY SUPPLY, INC. The Magnolia Fire Company would like to thank Moose Safety Supply, INC. for supplying the Pink Flash Hoods for the company to show the support of Breast Cancer Awareness in the month of September.